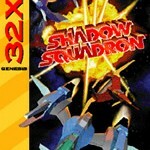 Shadow Squadron is one of the few, (I mean very few) underrated Sega 32X games. Sure, this game is a LOT like Star Wars Arcade, but it’s much better. 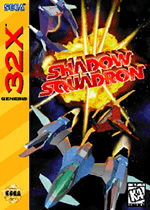 Shadow Squadron is one of those few 32X games that push the system to its limit. If you are looking for a game that pushes the 32X to the max and is very fun to play, then this game is for you. All too few games took advantage of the 32X’s capabilities to enhance their presentation, and in this regard Shadow Squadron is a mixed bag. It’s very, very good looking and pushes the 32X to the max. However, there is a little bit of slowdown. Now, it’s not a big problem, and is minor so luckily you won’t even notice it, but when the slowdown occurs, it happens when you aren’t busy. For the record, this game is a lot better looking than Star Wars Arcade, (but still Star Wars Arcade is good-looking). There isn’t much to say about the sound, but the sound is quite good, the music is CD quality and the sound effects are nicely done. Games are all about control, and this is where Shadow Squadron really shines. The gameplay is a behind the view type of shooter that gives you control of two similar ships. Just like Star Wars Arcade, there is not a fixed amount of room to work with, you can move around in fluid 3D. However, like Afterburner and Star Wars Arcade, when you really dive into what the game has to offer in terms of the game play and even the control, there is little here that differs from one mission to the next, leaving you with the feeling of repetitiveness. The weapons are kept simple with lasers and missiles being your only choice and you’ll have to learn to work with them at all costs. The game is rather fast, but it can seem slow because there isn’t a time limit to work with. You don’t have to deal with a time limit, however. Sadly, there isn’t much replay value other than a rather limited two-player mode. Even cooler, there is a very nicely done option where you can view some of the ship models in 3D. But at the end of the day, it’s a very short game. Shadow Squadron is a very fun game to go back time after time and play it. However, since some 32X fans and critics ignored it, the game is pretty cheap and rather easy to find. A worthy purchase, nonetheless.